During a New England car trip several years ago, my nostalgic streak propelled me to seek out as many indigenous, homespun landmarks as time would allow. After crossing a particular covered bridge in Vermont, I peered back at a sign nailed above the archway only to see that the structure – constructed to resemble the truss bridges of yore – was actually built in 1982. My sense of wistful excitement instantly evaporated. 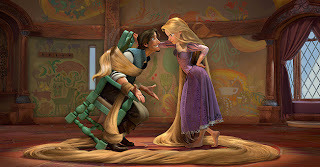 While the computer-generated Tangled is made to resemble a throwback, hand-drawn Disney animated classic, its 3-D countenance and benign, uneven script betray something trying a little too hard to hearken back to a simpler age of animation, to be the anti-Pixar, anti-Shrek kiddie flick. Unfortunately, the narrative baby gets thrown out with the pop-culture-referencing bathwater. In this revamp of the Brothers Grimm fairy tale from writer Dan Fogelman (Bolt; Cars), an infant Princess Rapunzel is kidnapped from her regal crib by Mother Gothel (voiced by Tony Award-winning Donna Murphy), an old crone who covets the young ingénue’s long locks for their restorative, anti-aging properties. Forbidden by Gothel from ever leaving her ersatz home, the grown-up, doe-eyed Rapunzel (Mandy Moore) eventually yearns to venture into the outside world. She finally finds the chutzpah to descend her tower prison after being visited by Flynn Ryder (Zachery Levi), a handsome, wiseacre bandit on the run from the authorities whose principal functions are to be a love interest and a fount of one unfunny one-liner after another. The aim of presenting a spunkier, self-assured damsel-in-egress somewhat flies in the face of the symbolism of a female lead who disables foes using a frying pan and her flowing blond hair. Plus, after the relatively underwhelming box-office draw of The Princess and the Frog, Disney execs changed this film’s traditional title to a more gender-neutral one. Veterans Alan Menken and lyricist Glenn Slater compose a number of serviceable songs throughout, although they only come to life when channeled through Murphy’s formidable pipes. As the storyline lurches about, you’re left to ponder such mundane matters as why all the king’s horses and men are assigned to retrieve a stolen crown, while the only effort expended to find his lost daughter is floating a bunch of hopeful lanterns into the cosmos every year on her birthday. Tangled tries to blend traditionalism with hip modernity. However, bridging that gap proves a bridge too far.